Upper Deck Authenticated started working with Hobby Shops last year to create an in-store event for consumers to see and purchase the latest and greatest in Upper Deck Authenticated Memorabilia. 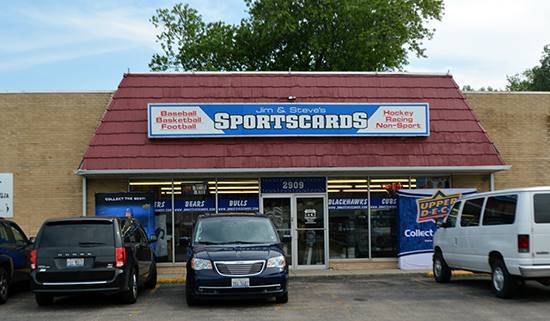 We started out with the very first of our ‘UDA Roadshow’ series at Jim & Steve’s Sportscards in Waukegan, IL on July 28th, 2015. I remember because it was my birthday, and there’s nothing better than a sports fan hosting a cool Hobby event on their day. I even got balloons and the Happy Birthday song serenaded to me by all the terrific customers in attendance! Steve Wilson, shop owner of Jim & Steve’s invited all his best customers. His lovely wife Kathy setup an incredible food and beverage station. Customers showed up and were greeted with an Upper Deck door favor. Upper Deck shipped in a variety of UDA memorabilia pieces – images, jerseys, balls, framed pieces, etc. and had them available for customer purchase at a special discount. Purchasers of UDA memorabilia and UD trading card products were given raffle tickets based on their spend, with names drawn for more prizing. Customers spending above a certain threshold were also given bonus ‘gift with purchase’ UDA items. Friday, October 21st 5-8 p.m. This years’ event will be similar- a door favor for the first 30 attendees, gift with purchase items on certain purchases, pack wars and raffles for prizing and food and beverage, compliments of Upper Deck and Jim & Steve’s. Please plan to join us and start your holiday shopping early by taking advantage of great pricing! Who knows – that ‘gift with purchase’ item or a raffle prize could even finish your shopping or be a stocking stuffer for someone on your holiday list. Fun and easy shopping for the sports fans on your holiday gift list.